Honda recently updated both the Activa 5G and the Activa 125. While the Activa 5G now retails for Rs 52,460, the Honda Activa 125 gets a price tag of Rs 59,621 (drum) (all prices, ex-showroom). Although they share most of their components, they are separated by a price difference of almost Rs 7,000. So how does the more affordable Activa 5G stack up against its elder sibling, the Activa 125? Let's find out. At first glance, both the Honda Activa 5G and the Activa 125 may look similar to each other. However, take a closer look and you'll see subtle differences. The Activa 5G continues to sport a conventional scooter design, with a somewhat bulky bodywork, while the Activa 125 adds a bit more flair with large portions of chrome. Yes, the fifth-gen Activa gets chrome at the front too. But the update is so subtle that you may not even notice it. In terms of features, the Activa 5G comes with the all-LED lighting and a 4-in-1 lock mechanism. If you go for the Deluxe variant, you also get a new semi-digital instrument console with an ‘ECO’ speed indicator and a service reminder borrowed from the 125cc Honda Grazia. The Activa 125, on the other hand, feels a bit more premium thanks to its large chrome accents on the front apron and the single-piece tail lamp with integrated turn indicators. It also looks taller and bigger than the Activa 5G. The latest update has brought with it LED lighting at the front, a 4-in-1 lock mechanism an ‘ECO’ speed indicator as well as a service due indicator. Opt for the Deluxe variant and the Activa 125 comes with black alloy wheels and chrome-plated metal muffler protector. The Honda Activa 5G continues to be powered by the same 109.19cc, single-cylinder, air-cooled engine which produces 8PS of power at 7500rpm and 9Nm of torque at 5500rpm. 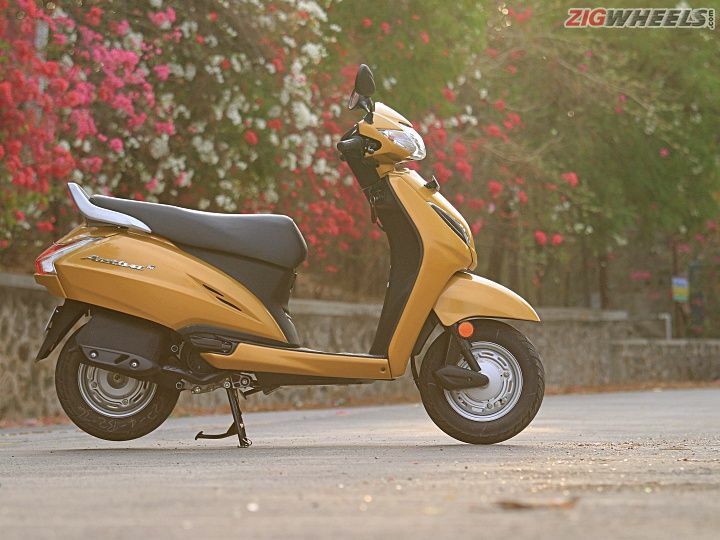 In our review, we found that the performance remains pretty much the same, which is not a bad thing given that the Activa has always been a capable city commuter. If you wish to know more about its performance, check out our road test review here. While the Honda Activa 125 does pack a larger 124.9cc HET engine, it only churns out 0.5PS and 1.5Nm more than the Activa 5G. This isn't surprising considering the fact that the 125cc engine is based on the ageing 110cc engine. However, you immediately feel the difference when you open the throttle. The Activa 125 accelerates quicker and feels faster. Refinement is top-notch with vibrations coming along only after you cross 80kmph. But then again, they are muted for the most parts. Being a family scooter, don't expect to see aggressive handling dynamics from the Honda Activa 5G. However, the suspension has been designed to tackle our roads perfectly. Its quite flickable and wading through traffic isn't a concern either. But we do wish Honda had done things differently. The Honda Activa 5G continues to come with the same bottom-link suspension setup that's been there for the last 18 years. We hope the company will equip the next generation of the scooter with a telescopic fork instead. The braking remains unchanged as well. It lacks the initial feel and requires you to squeeze them fairly hard to get them to slow you down in a hurry. An optional disc brake could solve this problem easily. As for the Activa 125, it rides much better than its smaller sibling. However, it’s still on the stiffer side. Thankfully, it’s telescopic front forks manages to absorb undulations and bumps quite easily. Braking is also impressive, with it offering good bite and progression. However, it does have a tendency to lock under severe pressure. Not to forget, it also gets an optional disc at the front, which significantly increases its stopping power. The fifth-gen Activa is sold in two variants - Standard and Deluxe. The Standard variant is priced at Rs Rs 52,460 (an increase of Rs 1,000 over the 4G), while the ‘DLX’ variant retails for Rs 54,325. The Honda Activa 5G rivals the TVS Jupiter and the Yamaha Ray-ZR. The Activa 125 is now priced from Rs 59,621 for the drum variant and goes all the way up to Rs 64,007 for the disc variant (all prices, ex-showroom Delhi). The Honda Activa 125 goes up against the Suzuki Access 125 and the TVS NTorq. 2018 Honda Activa 5G: What’s New? Is This The New 2019 Activa 125 Or Activa 6G? Share your experiences with Activa 5G?